At TMS, we’re on a mission to help Grow Happiness. That means helping out in our communities whenever we can and spreading Joyitude throughout the world. With the recent kickoff of our new blog, Happy Hub, we couldn’t resist including a feel-good section to share what we’re doing outside of the day-to-day routine. In August, we focused on how we could help students and families as they entered the new school year. September signifies that summer is drawing to a close and the school year has begun. Sunscreen and water balloons have been traded for notebooks and lunchboxes. Those school supplies add up, though, especially for low-income families. This year, it is estimated that 15 million children in the United States live below the poverty line, and another 15 million are part of a low-income family. The National Retail Federation said that families with children in elementary through high school planned to spend an average of $684 each, for a total of $27.5 billion on back-to-school supplies this year. This includes clothing, shoes, electronics like computers, calculators or phones, and supplies such as notebooks, pencils, backpacks, and lunchboxes. 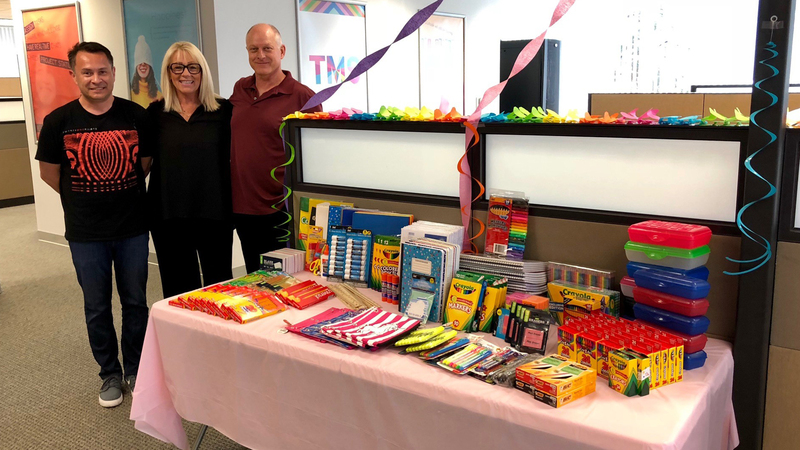 TMS thought back-to-school season would be a great opportunity to help grow a little happiness, so we set up a company-wide school supply drive. The Pink Unicorns (i.e. awesome TMS team members) in each of our locations brought in hundreds of new supplies to donate to local schools and charities. Overall, we were able to help children in several different locations throughout the US. One school that received donations from the drive was John Page Middle School in Madison Heights, MI, which is part of Lamphere Schools. We spoke with Leena Hosler, who is a Speech Language Pathologist at the school and works with students who have communication disorders. Many schools in America use more expensive supplies, like tablets and graphing calculators, in addition to everyday supplies. Unless the schools are able to provide these items, it can be extremely difficult (if not impossible) for families to afford these luxuries. “We don’t require students to have these expensive devices. We know many of our families don’t have the means to provide these. In fact, some of our families do not even have internet access at home,” Hosler said. In addition to local schools, our office in Phoenix donated supplies to Treasures 4 Teachers. Treasures 4 Teachers gives teachers in Arizona access to a wide selection of materials, resources, and training that can help to enhance and expand the learning process for their students. Their website states, “On average, teachers in America spend $500 to $1,200 each year from their own pocket on school supplies.” Treasures 4 Teachers helps to make supplies more affordable by charging a minimal membership fee and offering discounted items. Our offices in Meriden and Santa Ana donated their supplies to United Way. United Way focuses on education, income, and health, which they identify as the building blocks for a good quality life. They say, “Success in life begins with a quality education. And yet, millions of children and youth lack the support they need to strengthen their literacy, stay on track in school, graduate high school and find a career.” That support begins with having the right tools and supplies to be successful in school. Even though the school year has started, it’s never too late to donate. If you have kids, you know how quickly supplies are used. Take a look at the programs we donated to, or do a little research of your own! KINF (Kids In Need Foundation) is another great organization to look into. KINF works with teachers and school districts throughout the country to provide free school supplies to in-need students. Donations from TMS went to Wren Avenue Elementary in Concord, CA, Jackson Main School in Hempstead, NY, Milton L. Olive Middle School in Wyandanch, NY, John Page Middle School in Madison Heights, MI, Treasures 4 Teachers in Phoenix, AZ, and United Way in Meriden, CT and Santa Ana, CA.